The colors they used were inspired by the painting over the mantel. Although the house is clearly bigger than what you’d usually think of as a cottage, they were aiming for that kind of charm and style in the rooms. Visit BHG for all the photos and details. This is a storybook cottage. Charming from the front door to the wonderful splashes of color inside. The colors are happy without going over the top. Beautiful kitchen. This home feels truly like a well loved family home. Love it. I remember this house — I thought all their light fixtures were pretty rad. Ditto on the front door color love, Maddie May. I’m trying to persuade myself to do something NOW with our front door color. The exterior will be white + gray . . . + I worry that red is SO ‘last century’! Mine too – still love the red. My house is 1890s. Our 12 year old cottage home has a red door, very English style. I wanted a storybook cottage and that is what we got. Love the red, but those other colors would look nice, too…just not on our house. 😉 Great cottage here, thanks for sharing. Do you remember what issue of Better Homes and Gardens this house was in? I don’t. I couldn’t track it down. I keep hoping someone will fill us in! This is so pretty. Lots of white but not boring like some. Love the colors they used. This place is gorgeous, Julia! It’s just the right mixture of color, natural fibres and wood tones. I loooooove this kitchen! Yeah, she might regret that. Ha. This is the exact house I have cut out and used for inspiration as I have been remodeling my house. The light fixture in the living room I found after searching and searching and searching the internet. When I found it I saved it and drooled over it, but could never justify the cost. Sigh, I still want it. I am swooning over here! Love it! Nice balance between the white and the color. I think the woodwork really makes this house – moldings, built-ins, paneling, etc. Very nicely decorated too, and I love the exterior!! I LOVE everything about this home!! 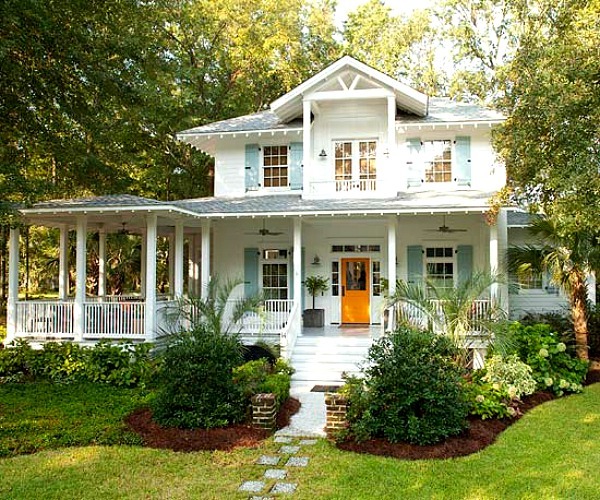 I love this house – The citrus accents are so pretty, and the front porch is just dreamy. Love all the sunshine in the kitchen, too. Thanks, Emma! It really is a frustrating site to try to navigate. Wish they’d give it a more user-friendly makeover–it would sure make my life easier when I’m trying to track things down on it! I agree! I love BH&G, and I’ve had a subscription for years. I wish they’d get a more user-friendly site with a better catalog of their images. I have stacks of pages I’ve torn from the magazine over the years, and I’d love to get rid of the paper, but when I try and find the images from the issues online, I rarely have any luck. I’m a total techie and am hooked on the website Houzz for most of my photo gathering for our upcoming renovation but overwhelmingly, like Erin, I still clip and save pages from magazines. Some things are too good to change. Love everything about this house, love the stairs with the space under them! I hope you get some sunshine too. It’s sweet and beautiful out here in Washington State! Thanks, Julie! It’s still raining here and looks like we’ve got nothing but more rain to look forward to all week. Boo. I love this house! Im pretty sure that I pinned almost every room to my “someday” beach house folder in Pintrest. Thanks for brightening up my rainy Monday, Julia! I love all those pops of color. It just gets me inspired to do that to my house. This house is beautiful. The pops of color are so pretty. I love the view under the stairs! I want to see what they did with the wonderful outdoor space to the left of the front door. Looks like a beautiful porch area. This house just seems like such a happy place, loving the colors. Love it (except for the plastic chairs). 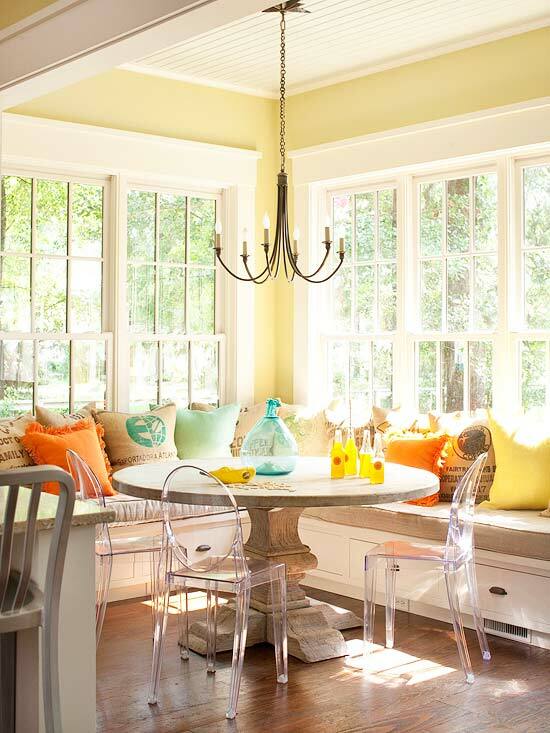 I agree, the Lucite chairs look out of place, I guess they don’t break up the space visually….but I don’t care for them. LOVE the rest of the house!!!!! I totally needed this post today! How refreshing 🙂 I don’t think there’s a space in this house that I don’t love. Thanks for sharing!! So light and airy! Love how they used the space…love the cozy built in bench. What a bright and cheerful house. I want a home like this where the sunshine brightens up the rooms. I saw some of these photos on pinterest about a year ago and I pinned them to some of my boards. How fun to see them on your blog. Here in Washington we have had beautiful weather these past few weeks. It’s the best Spring we have had in a long time. I wish I could bring some of this sunshine to you. I’m also in Washington! Betcha you didn’t know you had so many WA followers. I LOVE these colors. Did you pin them? I’ll have to do that when I get home to my laptop. Perfect for our “someday” cabin. What a happy happy house! I love all the color in it. We have had our share of rain and cold here, too. What in the world is going on with the weather these days?? Does anyone know where I can get the house plan? If there’s a floor plan available, it would be at BHG. Follow the link over there and see what you can find! Cozy and beautiful! Love it! What a bright and comfortable home…sort of like ours…but I would love to have that porch! Wow, really well done. I especially like the orange door with the blue shutters. Wow! I love everything in this house. It is amazingly done with all the bright colors inside and out. It looks bright and cheerful! It’s so great to live there. When I first saw this a few years ago, I immediately smiled. The colors, the light, the cozyness of this home is beautiful. Thanks for reminding me to find my magazine and have another swoon fest! I read all the comments and not one person asked you about the coral and white striped curtains. I want them!! I just painted my living room a dark gray and we have a lot of white custom trim!! Thanks to my wonderful Trim Carpenter Hubby!!! and I am looking for gray and white or coral and white curtains!!! Hi Julia thank you for sharing this beautiful home. Love the colour scheme. It has a happy look about it. Hope the sun shines for you soon. I don’t know about you guys but too much rain depresses but everything in the garden turns a beautiful green. Regards Esther from Sydney. PS in case I get sidetracked Have A Happy Mothers Day. 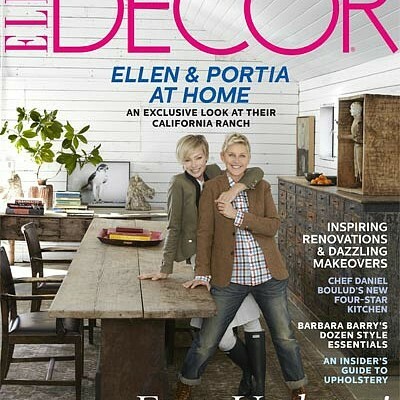 Where can I buy the beige/burlap color with print throw pillows used on th banquette? Thanks. I believe the article said they made them from old bags. Follow the link at the end of my post to the Better Homes & Gardens website for source info like that. I believe the article said they sewed them out of two different fabrics. Go to the BHG article for all the source details. What issue of Better Homes and Gardens was this house from? It’s my dream home, and would like to get a tangible copy of it. Wish I knew! I couldn’t find that info on their website anywhere. I have subscribed to the mag for years but didn’t remember seeing this article so I thought maybe it was new. Several readers have mentioned that they remembered it from last year, though. Does anyone know the issue it was in? This home was in the February 2011 edition of BHG…I tracked a copy down on ebay, and this house has provided so much inspiration for the home addition we are starting! 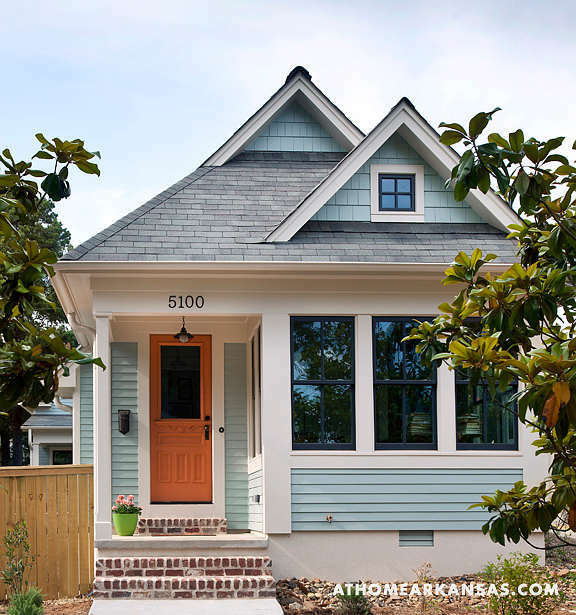 Does anyone know the paint company used for the blue gray shutters or the “tangerine” front door on the Fresh Squeezed Cottage? I would like to track them down. Also, can anyone tell what color the roof is?